Why are the Birch Dying? How did birch come to dominate the North Shore landscape? The North Shore coastal forest looks much different today than it did before European settlement. Much of the pine, cedar and spruce that dominated the area was removed by logging in the early 1900s. Extensive fires in the 1920s and 1930s swept through the slash that was left behind and many of the birch trees originated after the logging and fires. Why are so many birch dying? 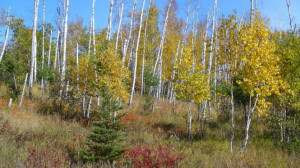 Paper birch (Betula papyrifera) is a relatively short lived species – on average 60 to 70 years. It is a shallow-rooted species with 90% of its roots in the first 3 inches of the soil. These roots are sensitive to temperature increases. Few roots reach deeper than 24 inches (60 cm) below the soil surface, leading to vulnerability from high wind events, like the one occurred in July of 1999. During the summers of 2001 through 2003, forest tent caterpillars ate their way across more than 7 million acres of forested land in Minnesota. In and of itself the defoliation caused by forest tent caterpillars does not adversely affect a tree’s health, but combined with the advanced age of the trees, several years of severe drought and disruption from highway construction and repairs, the North Shore birch have had a lot to handle. When birch trees become stressed, they become vulnerable to an insect called the bronze birch borer (Agrilus anxius). The first symptom of an infestation is often yellow, sparse, stunted foliage in the upper crown progressing to twig and branch dieback. Trees may decline for several years before dying, although they may die during a single year if conditions are hot and dry. Evidence of the bronze birch borer has been found in the trees on the north shore. In short, birch are dying due to their old age, which also makes them susceptible to other stessors, which include drought, wind, and insect infestation. Why haven’t the conifers of the past forest regenerated? Other factors have fundamentally altered the ecology of the coastal forest. Because the logging and fires left few older pine, cedar and spruce trees to provide seeds, those trees have not returned to most parts of the shore. Periodic fires that drive the natural cycles of vegetation change have been suppressed. These fires reduce fuels, prepare the ground for pine regeneration, release minerals and nutrients from the soil, create a mosaic of habitats for wildlife, and reduce the build-up of shrubs. The presence of deer, especially the high populations of deer in winter and spring, has dramatically changed the forest. Deer browse conifers very heavily in the winter and spring, when their summer diet of green leafy material is gone. This keeps natural succession to conifers from occurring. White cedar is a favorite deer food, along with white pine. Cedar seedlings can survive under deep snow, but will be eaten to the ground when exposed. A common sight on the North Shore is a white cedar tree with every branch under seven or eight feet gone. The North Shore Forest Collaborative’s mission is to revitalize and maintain a healthy and functioning ecosystem along the North Shore of Lake Superior with emphasis on restoring and maintaining native trees and associated forest communities. This includes an emphasis on planting conifers and protecting them from deer browse.